With their honey-like sweetness and unique texture, figs are a delicious choice. This savory fruit belongs to the mulberry family. Whether you prefer it fresh or dried, you'll get a lot of fiber, vitamins and antioxidants in one small serving. Younger-looking skin, luscious hair and better digestion are just a few of the many benefits of figs. Fresh or dried, figs are a powerhouse of nutrition. These naturally sweet fruits boast large amounts of vitamin C, vitamin K, potassium, phosphorus, magnesium, calcium and fiber. They're also packed with quercetin, kaempferol, epicatechin gallate and other powerful antioxidants. Despite their high sugar content, they support health and may even aid in weight loss. The same amount of fresh figs has approximately 111 calories, 1.2 grams of protein, 0.3 gram of fat and 28.8 grams of carbs, including 24.3 grams of sugars and 4.2 grams of fiber. They're lower in vitamins and minerals than dried figs, but they also boast fewer calories. When it comes to dates vs. figs, the latter are lower in calories and carbs. One cup of dates contains 415 calories and 110.2 grams of carbs, including 93.1 grams of sugars, which is a lot more compared to dried figs. These delicious fruits nourish your body from the inside out. Rich in vitamins and minerals, dried figs can help prevent nutrient deficiencies, strengthen your bones and make weight loss easier. They're chock-full of antioxidants that slow down aging and scavenge free radicals that cause oxidative stress. If you're struggling with constipation, look no further. Due to their high fiber content, these fruits will keep you regular and relieve abdominal discomfort. Your immune system will become stronger, too. According to a 2015 study published in the journal Fish & Shellfish Immunology, figs contain plant-based compounds that stimulate the immune response and regulate certain genes involved in immune function. One cup of dried figs delivers nearly a quarter of the recommended daily calcium intake. This mineral protects against bone loss and osteoporosis when consumed as part of a balanced diet. A 2018 review published in Sains Malaysiana indicates a strong link between fig consumption and bone health. According to researchers, the mineral content of this fruit closely resembles that of human milk. Several studies cited in this review suggest that figs may help prevent osteoporosis due to their high levels of calcium, magnesium, potassium and phosphorus. These nutrients support bone growth and maintenance. Calcium and potassium may help slow down bone thinning and reduce urinary calcium loss. Furthermore, figs exhibit antioxidant, anti-cancer, anti-inflammatory, hypoglycemic and hepatoprotective effects. When consumed in moderation, these fruits may aid in weight loss and make clean eating easier. The fiber in dried figs increases satiety and curbs hunger, which in turn, helps reduce total food intake. As Harvard Health Publishing points out, high-fiber diets not only improve weight control but may also protect against heart disease and diabetes. A 2017 study published in the Journal of Nutrition and Metabolism has found a positive association between low fiber intake and a high body mass index. Scientists suggest that eating more fiber may improve overall health and reduce body weight. Additionally, dried figs are naturally sweet and contain no added sugars. Therefore, they're a healthier alternative to cookies, milk chocolate, cake and other processed foods. If you're trying to slim down, add some figs to baked goods, waffles, pancakes and smoothies instead of sugar. Eat these fruits after exercise to replenish your glycogen stores and help your muscles recover from training. Beauty starts from the inside out. Your diet has a direct impact on the appearance of your hair, skin and nails. Dried figs are loaded with antioxidants and other micronutrients that promote skin health and strengthen your hair. According to the Journal of Pharmacognosy and Phytochemistry, these fruits boast antioxidant and antibacterial properties. They are an excellent source of gallic acid, catechins, saponins and other phenolic compounds that protect against oxidative damage, a major contributing factor to aging and chronic diseases. These findings indicate that figs may protect your skin from oxidative stress and slow the aging process. With their antimicrobial properties, they may help prevent bacterial skin infections and strengthen your natural defenses. Zinc and iron, two key nutrients in figs, promote hair growth and reduce hair loss. The health benefits of figs are largely due to their high antioxidant levels. A 2014 study featured in BioMed Research International shows that Omani figs may improve memory and reduce oxidative damage to the brain. The antioxidants in these fruits may delay plaque formation in Alzheimer's disease and protect against neuronal degeneration. This study suggests that figs have beneficial effects on the brain and could improve memory-related behavioral deficits. Further research is needed to investigate their role in mental health and the prevention of neurodegenerative ailments. Researchers attribute these benefits to the high levels of flavonoids, quercetin, ferulic acid, anthocyanins and other potent antioxidants in figs. Dried figs are quite high in sugar, so they may not seem like the best choice for people with diabetes, and yet the opposite is true. A recent review, which was published in the Journal of Ethnopharmacology in 2018, indicates that several Ficus species, including the common fig, may reduce blood glucose levels and improve insulin response. These fruits are high in vitamin E, sterols, coumarins, tannins and other bioactive compounds with antidiabetic properties. According to BMC Complementary and Alternative Medicine, mistletoe fig (Ficus deltoidea) may inhibit drug-induced hyperglycemia and relieve diabetes complications. Its leaves appear to be particularly beneficial. Also, remember that figs are packed with fiber. This nutrient improves blood sugar control and aids in weight management. In 2018, the journal Science published a study on the potential benefits of fiber. Scientists found that high-fiber diets promote the growth of gut bacteria responsible for producing short-chain fatty acids (SCFAs). These healthy fats regulate inflammation and appetite. A diet rich in fiber can balance the gut flora and increase SCFAs, making diabetes management easier. From improved blood sugar control to healthier skin, dried figs have various therapeutic properties. Plus, they taste amazing and can be used in countless recipes. Make your own granola bars, energy bites and other delicious snacks. Swap sugar for figs to boost your nutrient intake. 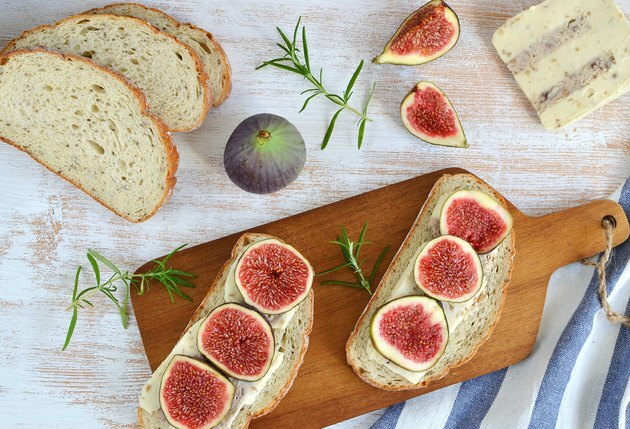 Have you ever tried figs on toast, fig cheese puffs, roasted figs with walnuts or apple and fig custard? If not, it's time to add some variety to your diet. These fruits can turn any meal into a gourmet treat and take your recipes to the next level.